It’s that time of the year when most folks look forward to holidays, home and hearth. That’s most folks. We looked East (or East with a West hangover if you are going to be picky) – towards Turkey. As in the country, not the bird which I decree to be the most tasteless bird I have had the (dis) pleasure of eating. I guess size isn’t everything. So onward or east ward as they say. Most Turkish food we have thus far eaten in the Bay Area has been pretty mediocre. Given that we are spoilt for choice with Mediterranean cuisine, no one should have to settle for just average so we have mostly avoided Turkish cuisine. 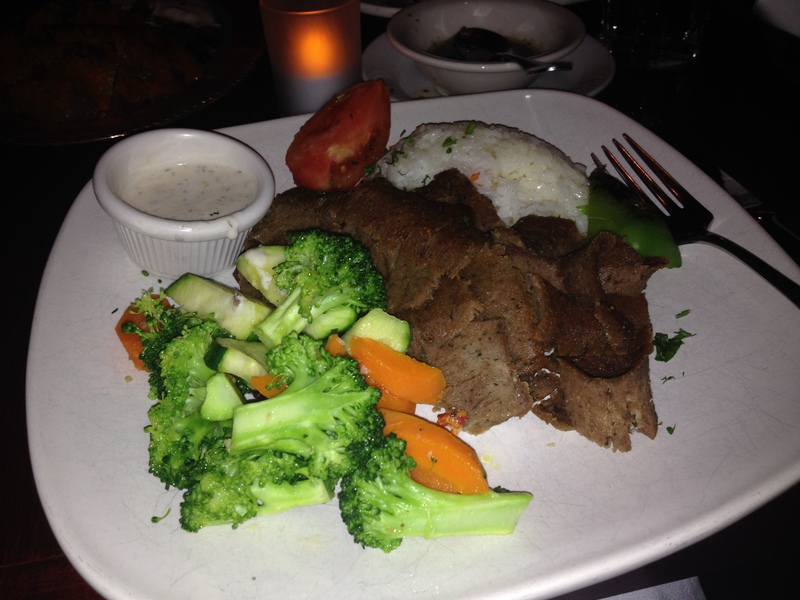 However, we decided to give Anatolian Kitchen one shot. A good shot actually, on a special occasion with reservations and ironed clothing. For a weekday night the place was P-A-C-K-E-D so we felt as smug as a bug in a rug (ok, sorry I’ll stop) that we had the foresight to plan ahead and reserve a table only to be met with a quizzical bushy eyebrow which inquired quizzically whether we had really truly reserved a table. Strike one. Cue irritation and annoyance. While we were squished to the side of the entrance waiting, they told an Asian couple that they would have a half hour wait and then proceeded to promptly seat a Caucasian couple (minus reservations) before they had both barely set foot in the restaurant. From where I was standing, this looked like a blatant racist preference. Strike two. So now I am full steam ahead pissed. Bushy eyebrow may have honed into my own twitching eyes and quickly seated us after making us wait with PFC in tow for a good half hour. Since we had enough time to mull over entrees we made our choices known to the waiter who had a haughty air about him and managed to exude a rather bored and annoyed look at us. You know, us, the people with the reservation they didn’t honor, us, the folks who might potentially be tipping him tonight. Once we placed our orders – Chicken Shish Kebab Plate for PFC who likes his entrees, Doner Kebab plate for TBH who likes red meat and the Iskender plate for me who was one dolma short of biting someone’s head off, the waiter visibly cheered up as if to say oh hey these aren’t the cheapskate desis who are going to split one entrée. Really. He was close to applauding. So while we were waiting for the food, I did a quick demographic sweep of the place to realize it was a seesaw of older (mostly Caucasian) folk and younger student crowd. Given the proximity to Sanford perhaps not a surprise. The décor was standard Turkish amulets and sheeshas, rugs and platters adorning the walls. Despite being a tad kitschy it was still warm and inviting though I would have warmed up to it a lot more if we were promptly seated. By now, as you may have guessed, I was not expecting much by way of service or a meal so I was really pleasantly surprised when the food was actually good. Not a go-weak-in the-knees fantastic – the rice was shocking bad for a Turkish place as were the boiled veggies but the meat was tasty and succulent if I grudgingly say so myself. 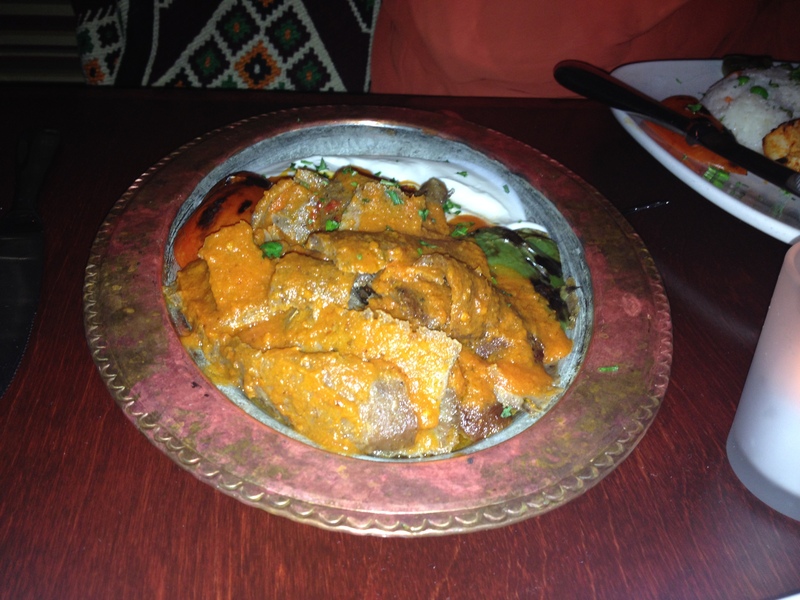 My Iskender plate with ground lamb and beef served with bread cubes over a tomato and yogurt sauce was not only generous portioned but flavourful as well. Even though I mostly avoided the richly soaked bread cubes, I wasn’t able to finish my meal.PFC wasn’t too thrilled about seeing a mound of veggies but scarfed down the chicken without much fuss. TBH’s Doner was also quite good without the gamey flavor that sometimes lamb can have.Needless to say he polished off his plate. The service was iffy at best and while they are a popular place, peering down your patrons’ necks to constantly ask if we are done, isn’t going to win you any brownie points. And speaking of dessert, we were too full to try any but their “Are you done already?” manner didn’t help much. Strike three. And they are out. So all in all while their food was better than I expected, their casual dismissal of our reservation, the downright rude and racist behavior of their staff means I won’t ever be coming back. Promise.